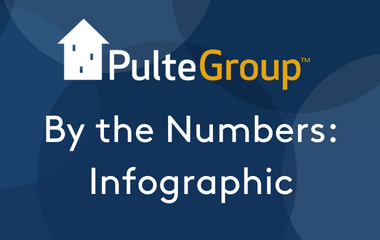 Since its founding almost 70 years ago, PulteGroup has delivered over 700,000 homes and today ranks as the nation’s 3rd largest homebuilding company with operations in 25 states and 47 major markets. Through our portfolio of leading brands: Centex, Pulte, Del Webb, DiVosta and John Wieland Homes and Neighborhoods, we are uniquely positioned to serve buyers at every stage of their lives. Click for infographic. Our diversified operating platform provides opportunities for growth and has allowed us to create a more balanced business: 30% entry-level and first-time buyers, 30% to move up, 15% to luxury, and 25% active adult. Through our Del Webb and DiVosta brands, we are the recognized leader in serving baby boomers as they move toward retirement. In addition to providing multiple avenues for ongoing business expansion, our diversification helps to reduce market risks. PulteGroup operates against its objectives of delivering high returns on invested capital and equity that, in turn, are expected to generate long-term shareholder value. Our return focus is reflected in our stated capital allocation priorities: 1) invest in the business through high returning projects, 2) fund our dividend, and 3) use excess cash to repurchase shares. Consistent with these priorities, for the five-year period of 2013 - 2017, the Company invested approximately $10 billion in land acquisition and development, while returning $2.8 billion to shareholders through dividends and share repurchase.